Cleveland Browns quarterback Jason Campbell (17) on the field after the game against the New England Patriots at Gillette Stadium. The Patriots defeated the Cleveland Browns 27-26. 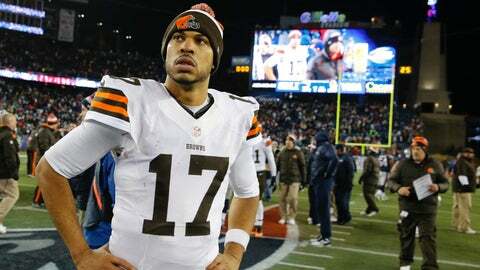 BEREA, Ohio — Chances are, one of these chances will be Jason Campbell’s last. That thought doesn’t scare Campbell. It drives him back into the playbook, the film, the meeting room. Collectively, the 4-9 Cleveland Browns are playing for a whole bunch of nothing in the season’s last three weeks. Individually, every player is playing for something. Campbell would like to extend this latest chance. He has a February roster bonus due; if the Browns pay it, he’ll remain under contract for 2014. Right now, it would seem the Browns have an opening for a starting quarterback in 2014. He’d like to think his timing is good, though he knows nothing is guaranteed. Last week, Campbell threw for a career-best 391 yards in a loss to the Patriots that was in no way his fault. He did it coming off a concussion, on a shortened practice week, as a Browns team that’s used three different starting quarterbacks this season had to change starters again. The Browns have won just one of Campbell’s five starts, but they’ve played well enough to win in four of the five. In three of the five, he’s posted a quarterback rating of 100 or more. Considering the norm with the Browns in recent years has been well below 80, that’s real momentum. Coming off the sixth-best passing day in franchise history, Campbell heads into the home stretch of his ninth NFL season looking to continue his solid play. A year ago he was the backup for Sunday’s opponent, the Chicago Bears, his third stop in a career that he hopes is far from over. "Part of me feels I was just hitting (my stride) maybe a (season) and a half ago right before I got injured," Campbell said of the broken collarbone he suffered against the Browns while playing for the Oakland Raiders in Nov. 2011. "It made me hungrier but at the same time it taught me a lot about patience. I lost my job to injury. You can’t dwell on it; you have to try to learn from it. "A lot of (the story of) my career has been injuries at times and some of it has just been a different offensive coordinator or a different system every other year. But you know, everyone’s career is different and through mine it’s just been persevering and moving forward and not getting distracted when things do happen — just try to make the most of it." He was 4-2 as Oakland’s starter before suffering the injury in 2011 and building off the momentum he’d created in his two best statistical seasons, in 2009 in Washington and in 2010 in Oakland. He’s thrown nine touchdowns vs. just three interceptions with the Browns this season, and he’s provided a steady, veteran presence to an offense that needed one. Josh Gordon is on the best four-week run for a receiver in NFL history, and last week Campbell kept feeding Gordon as he got open. "My goal is to keep doing the things that I can to do improve as a quarterback and improve as a player," Campbell said. "There’s a lot of youth on this team. You can see a lot of progress is being made from last season to this season. "Talking to the guys, Jordan (Cameron) and Josh, you see how much they’ve grown from a season ago to where they’re at now. The offensive line has been intact for the most part. It’s definitely an opportunity for us to keep going in the right direction, in a positive direction. I see a lot of upside here. We just have to keep plugging away and just keep fighting and pushing each other." With two first-round picks and two third-round picks in the 2014 NFL Draft, the Browns are positioned to add a rookie quarterback — even if the price is very high. The Browns have had a league high 21 quarterbacks since 1999 and eight different starters since 2009. Though it’s too early to know which direction the front office will take at the game’s most important position, it would appear that jobs are open for 2014. Late in the first season under the watch of the latest new regime, it also appears Campbell will have more chances to make an impression for the future. "If they bring in a young quarterback, of course (I’m) going to do everything I can to mentor them and help them," Campbell said. "At the end of the day, we’re still teammates. We’re all competing for the same jobs, but you’re also helping your teammates. "You always try to play this game with confidence. Every game is not the same, but you want to make sure you’re doing your best. I feel comfortable with the guys around me. I feel like guys are fighting their butts off. You’re watching Josh have one of the most exciting seasons out of a receiver in NFL history. So even though our record is 4-9, there are a lot of positives that we can take out of this season." Campbell was on a one-year deal with the Bears last season, and he chose the Browns last spring looking for a chance to help a young team. If this really is his last chance, he’s just looking to continue to play well and maintain that confidence. "I try not to think about that," he said. I really don’t. I just play every game the best I can. When I’m done in the NFL I’ll know I did the best I can with whatever situation. I’m not going to look back on it and say ‘what if’ or anything like that. It is what it is." Right now, it’s an opportunity to keep a foot in a door that remains open.